The First Temple was built by King Solomon and is described in 1 Kings 6. It was a magnificent affair, requiring the labors of over thirty thousand workers. The temple served as a holy worship place for God. Over time, a succession of kings appeared who allowed the temple to degenerate into idol worship. The people lost their divine vision and were weakened. Jerusalem was no longer able to defend itself effectively and was attacked repeatedly by the Babylonians. In 586 BCE, the Babylonians overwhelmed Jerusalem, burned the city, and destroyed Solomon’s Temple. This left a great stain on the soul of the Israelites that would remain for seventy years, until the Second Temple was built on the same site. This reading describes the rebuilding of this temple. 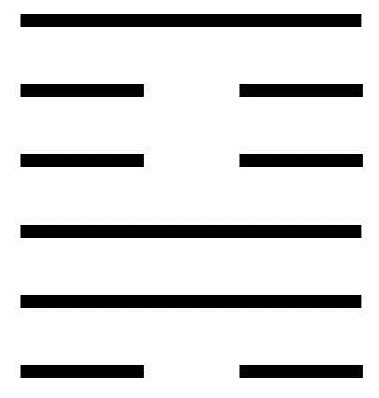 The upper trigram is Stillness, with the image of the rigid Mountain. The lower trigram is Spirit, with the image of Gentle Wind. Both trigrams are relatively passive. The inactivity results in decay, which now must be restored. To rebuild that which has been allowed to spoil. To realize that the rebuilding will take effort and will involve danger. To understand that the cause of the decay is the abuse of human freedom. To not move forward until the causes of decay are well understood. To stir up public opinion and reground the people in God. A moving line in the bottom position suggests that rigid adherence to tradition is the root cause of the decay. Fortunately, the decay has not progressed far and can still be remedied. This will take dedication and may involve danger, but now is the time to deal with the issue. A moving line in the second position tells us that mistakes made through weakness are the cause of the decay. In this case, gentler consideration and deeper reflection are called for. A moving line in the third position warns that we shouldn’t be overly enthusiastic about the restoration. This enthusiasm has already resulted in discord. While not ideal, too much enthusiasm is better than too little. The future still looks good. A moving line in the fourth position describes one who is too weak to take the necessary steps to stop the decay. Even though the decay is just starting to be visible, nothing can be done to stop it until it runs its course. A moving line in the fifth position describes one who is confronted with corruption through neglect. This person is not strong enough alone to correct the decay, but with the help of others can at least address the corruption. This is a good start. A moving line in the top position suggests that not all are called to take an active role in correcting the problems of the world. Some are called instead to cultivate an inner Wisdom. This does not imply sitting around and criticizing what others are doing. It means cultivating the human values that will provide a foundation for the future.